6mm of rain is this month’s total and 4mm of that fell on the last two days of the month. The 17th, 18th and 19th saw us reaching 33.4c, 33.2c and 33.4c respectively all at 13.17(BST). One result of the dry weather is a lowering of the water level in the River Dane. This has revealed more timbers in Andy's little archaeological find, click here to see some of the latest pics. 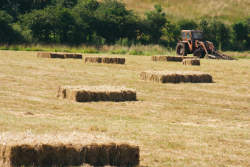 All the hay is now made and stored however the large quantity of first cut silage looks like all we will get, as everywhere is now brown, dry looking and grass is hardly growing. This means that the second cut fields are having to be grazed. The elder flower in the hedges in many places seems to just be dying as it has turned brown and shed its leaves. The only thing growing on our late sown re-seed are some weeds. Interesting times and reminding me of the year I left school: 1976 famous as a drought year. The roadshow has visited Timperley and here is Margot making her first appearance for us out on the road. 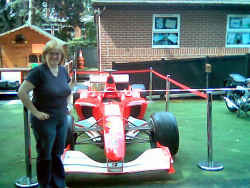 You never know what attractions may be at these events and this is a genuine 2003 F1 Ferrari as driven by Michael Schumacher. Apparently one of the parents works for Bridgestone tyres. Dry weather has meant more time to work on the shed and now we have poured the foundations. The time consuming part of this is making sure that the concrete will all be level and then on the day working at full tilt as you only have around an hour to deal with it before it goes too hard. this involved team work. Simon and myself barrowing the concrete to the foundations as the wagon cannot get near them at present. Sarah with a hosepipe wetting the area to be laid with concrete and Sarah’s boyfriend Joe levelling. It took us just over the hour and that last ¼ of the load was rather hard to handle. Next month the walls will go up. The last Wednesday of July is the Nantwich show remembered by Dorothy (she won’t let me forget) for a very wet show in 1987 when we had to go in the Landrover and we spent the day slipping and sliding around the showground. Five days later Simon was born. 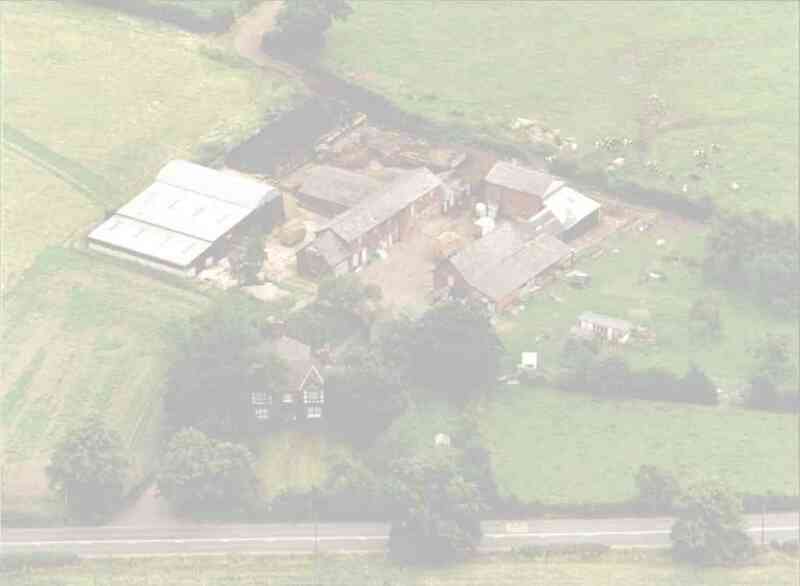 Nantwich is famous as the largest cheese show in the world and here is the stand of Dairy Farmers of Britain the place our farm’s milk goes to. 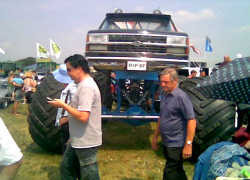 Besides the usual cattle etc here is one attraction a “monster-truck” these were performing in the main ring . Driving over jumps and crushing their way over scrap cars. Nantwich show sees many local agricultural firms showing off their latest products and as a one day show is much smaller than the Cheshire show. Many towns used to hold similar shows but during the 1960s their popularity waned and Nantwich is Cheshire’s only survivor. 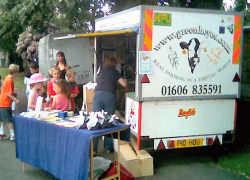 August will see us appearing with the NFU at the Peover game fair so say hello if you are there. Lastly don't forget to visit out nature page. See you next month, Phil.